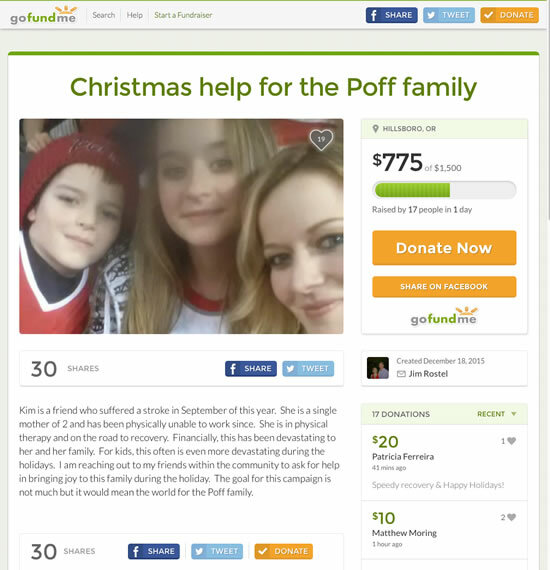 Thanks to everyone who contributed to the GoFundMe site for Kim. A generous donation from Dan Pasko reached the goal on Christmas Day. Don’t let that stop you from continuing to help out. It’s been a pleasure to bring you news and info on Portland and Northwest poker tournaments and players for the past year (or, at least, the last half of it). As I mentioned a couple of weeks back, the blog’s been around for five years, but 2015 was the year I tried to do much more than write about my own games mixed with some analytical articles. I started running daily reports on NW players in Vegas for the WSOP and other series in early June, combing reports for mentions of anyone from Oregon, Washington, Idaho, and British Columbia. Then, in the first week of August, I started running these weekly round-ups, based on the tournament calendar I’d been maintaining for a couple of years already. Then, a couple months ago, I egged you folks on to affect the results of PokerUpdate’s “Most Memorable” televised poker hand. That was sort of fun. I put up 110 posts over the year, with a 38-day streak during the WSOP, but the top three posts on the site for the year were all put up before 2014 (“Sweet Spot,” “How Good Is Good Enough?,” and “Why Not Rebuy?“). Anyway, now that the new year’s about to begin, there are lots of tournament options opening up (tip for newbies, events are colorized by geographic region: Nevada, California, Oregon/Washington/BC, and Other—mostly Alberta, Colorado, and Arizona—and there are buttons above the calendar that can be used to hide or show various regions). It’s been a treat. Hope we all have a good 2016. Two-day NLHE with 2 entry days (1/22-23, with final on 1/24). $235 buy-in. Structure sheets don’t specify re-buys, dealer appreciation, or fees, though there is a mention of ODAF in some of the notes below the schedule. Two-day NLHE Main Event with 3 entry days (1/28-30, final on 1/31) with $10K added to the prize pool. $500 buy-in. If you’re at Tulalip for the $60 Main Event satellite on the 20th, there’s a drawing for six Main Event seats. Final Table gets the Portland poker year off to a jumpstart with their First Friday $20K at 7pm. $100 buy-in/re-entry and a $50 add-on. Encore Club adds to the first weekend of 2016 with a $20K on Saturday at 8pm. Also $100 buy-in/re-entry and $50 add-on. Encore is closed New Year’s Eve. Aces Full is closed New Year’s Event and New Year’s Day. They’ll ring in the New Year with a $1K guarantee at noon on Saturday. The Game is closing at 10pm New Year’s Eve (but they’ll be open New Year’s Day). The Venetian New Year’s Extravaganza runs through January 10. The WPT California Swing Kickoff that was last week’s Deal is this weekend, with the $100K on Saturday and the Rolling Thunder main Event satellite on Sunday, both for a $400 buy-in. WPTDeepstacks at Hustler Casino in LA starts Saturday and runs through the 11th. It’s followed immediately by the four-day Liz Flynt Poker Championship (January 12-15). Event 1 of WPT Deepstacks is a $350 buy-in with a $250K guarantee. The Main Event is $1.1K with a $300K guarantee. The Liz Flynt event is a $200K with a $275 buy-in and six entry flights over three days. Sunday is a $317 buy-in Super Deepstack Freezeout at Black Diamond Poker Club in Albany. 1pm start time and 60K in chips. Sunday the 10th is an event at a club I haven’t mentioned before. Stones Gambling Hall is a new(ish) venue in the Sacramento area, in Citrus Heights about halfway between Sacramento and Lincoln (where Thunder Valley is located). The tournament is a two-day $100K guarantee, with a $1,110 buy-in, 40 minute levels, and 60 minutes at the final table (live-streamed). Kim Poff has been a bright spot of the Portland poker club scene for the past several years. She’s brought a smile and light to the dealer box the whole time I’ve known her. I hadn’t seen her around for a couple of months and assumed that I just hadn’t been in the right place, but news got out last week that she had a stroke in September and is in physical therapy to help her recovery. 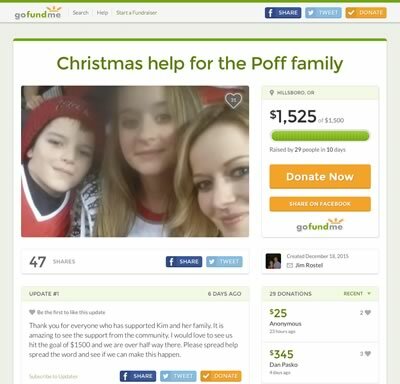 Jim Rostel set up a GoFundMe page for Kim and her children, to help them out at Christmas. Not asking for much and don’t worry about it being too close to Christmas. Any little bit will help. Portland players Jacque Lavadour and Allen Oh both cashed in the WSOP Circuit Main Event at The Bicycle Casino in LA last week. Gerald Huynh got into the money in the second Monster Stack tournament there. Eugene’s Jeanne Savage made the final table for fifth place in the first Monster Stack, her second WSOP cash and her second WSOPC final table this year. The next WSOPC series west of the Rockies is at Bally’s in Las Vegas at the end of February. Like you hadn’t heard. May 31 through July 18th. Main Event July 9-18. Colossus starting days June 2-4. Seniors event starts June 17th. If you’re driving south to LA at the beginning of the year for the WPTDeepstacks series at Hustler Casino, you might take a couple of days to hang out north of Sacramento at Thunder Valley Casino for the WPT California Swing Kickoff. Over the first three days of the new year, Thunder Valley will be running three tournaments (and numerous satellites). January 1: $25K guarantee welcome event ($150 buy-in). January 2: $100K guarantee with a $400 buy-in. January 3: WPT Rolling Thunder Mega Satellite with 20 $3.5K Main Event seats guaranteed ($400 buy-in). Yes, you’ll have to put up with more than two months of delayed gratification if you get one of the satellite seats (the first entry day for Rolling Thunder isn’t until March 12) but it’ll be like having the Golden Ticket in your pocket, knowing you’ll be heading back down to Lincoln for the big game in the spring. Thunder Valley is about a 10-hour drive from Portland, depending on conditions. Get your year off to a good start! Encore Club’s (and Portland’s) last big event of the year is the day after Christmas: a $35K guarantee with $200 buy-in (and re-entry) and a $80 add-on. They’re closed Christmas Day and New Year’s Eve. Aces Full is closed Christmas Eve and Christmas Day, and New Year’s Eve and New Year’s Day. They’ll ring in the New Year with a $1K guarantee at noon on January 2. The Game is closing Christmas Day and at 10pm New Year’s Eve. Portland Players Club is holding a $20 buy-in $1K guarantee at noon on Saturday. Late Addition: Final Table is putting on double guarantees at 11am ($2K, $20 buy-in) on Christmas Eve and 7pm ($4K, $50 buy-in) on Saturday. The Venetian New Year’s Extravaganza starts Friday and runs through January 10. It features two $150K guarantee events, along with a $100K event. The Venetian has posted the schedule for the first of next year’s Deepstack Extravaganzas, as well. It begins at the end of January. Planet Hollywood is the site of the PHamous Poker Weekend a week from Saturday (the afore-mentioned Boxing Day). It runs through the 30th, and features an inaugural $200K guarantee with a $565 entry. Sunday at 11am is Tulalip’s Last Sunday of the Month tournament. This month they’re adding $5K to the prize pool. It’s a $400 buy-in ($10 dealer toke). And it’s a Super Bounty $100). The WPT California Swing Kickoff in today’s Deal kicks off a week from Friday. WPTDeepstacks at Hustler Casino in LA gets going a week from Saturday (January 2). Event 1 is a $350 buy-in with a $250K guarantee. The Main Event is $1.1K with a $300K guarantee. Friday’s announcement of dates for the 2016 World Series of Poker—and particularly the details about the sophomore installment of the Colossus tournament—got people buzzing about the upgraded guarantees for both the prize pool and first place, as well as other changes. There’s a $7M guarantee for the prize pool this year. Last year was $5M, but the actual prize pool was over $11M. Cord Garcia only got $639K last year (less then 6% of the prize pool); this year’s winner—guaranteed $1M—could potentially get as much as 14% (though there’s need to be a significant drop-off of entrants from last year). A primary complaint about last year’s event—apart from the long payout lines and the general crush of people—was that Garcia got such a small share of the prize pool for coming out on top of more than 22,400 other players. His cash was an ROI of 113,000% (Joe McKeehan’s Main Event cash last month had an ROI over 75,000%) but many people felt it should have been 10% of the prize pool, or at least an even $1M. Large tournament payout structures are sort of an art. You need to balance the size of each payout step, the number of payouts at each step, and make everything match up to the total in the prize pool. For smaller events, you can use pre-defined tables, but the WSOP uses a formula to determine the payout steps (for the most part, see how the payouts in the Main Event varied over a decade in my article here), the approximation in the rate of increase for each step is something I wrote about for PokerNews.com. The median rate of increase (or acceleration in the size of each step in the payout structure) is about 100.72%. Almost every large 9-handed tournament payout structure does the same thing in the top 99 places. The top 9 spots are individual steps at the final table. Typically, the payout curve is structured so the amount of the payout for ninth place is around 10% of the prize for first. Next, there are three steps with three payouts (10-12, 13-15, 16-18) for the second table. Then there are nine steps, one for each table with these positions: 19-27, 28-36, 27-45, 46-54, 55-63, 64-72, 73-81, 82-90, and 91-99. By comparison, the 2009 Main Event had three payout steps with seven-table groups and five with eight tables (note the same jolt in the curve as in this year’s graph where the payout amounts were adjusted to increase the amount given to the bottom half of the final table). 2014’s Main Event had six payouts with seven tables each, and three with eight tables. The old days back in 2006 (when the Main Event had its largest-ever turnout: 8,776 entrants) were more haphazard. It was a little weird, with places below 81st paying out in steps of five tables, seven steps of seven tables, a step of six tables, a step of five tables, two more six-table steps, a step of five, and then 56 more places at the bottom step. And you can see that the payout curve was wonky, too (Jamie Gold’s $12M first place prize goes off the top of this chart). Adjustments in how many places pay out at each of the lower steps makes a big difference in how the money’s distributed. Recent payouts for the Main Event, as you can see above, have slight increases in the number of players being paid at the lower steps, unlike 2006 where the steps were all over the board. This is a similar graph for last year’s Colossus. Unlike the Main Event (at least in recent years), the number of players in the first step below 99 didn’t increase after several payout steps. It pegged out at eleven tables (99 players) and stayed there except for the bottom three steps. I don’t know if that’s a result of some issue with the payout system in use at the WSOP (maybe it has trouble handling more than 100 payouts at a level?). That’s not the only way the prize pool could have adhered to the payout curve though. This is all true. You can see from the curve that there aren’t the kind of odd wiggles and jumps you see in the payout curve of even the 2015 Main Event. There are a number of ways to work within the formula, however. It took me about 15 minutes to come up with this payout structure that would have paid Garcia (or whoever else might have won in 2015) a cool million for last year’s Colossus. This structure compresses the number of payout levels, and has as many as two times the number of players paid out at the lower payout levels. It starts with 180 players making $1,275 (versus $1,096 for the bottom 81 payouts in the actual payout structure). The top positions all get more than $100K in my version. Combined, there’s $1.5M more awarded to the final table if the winner gets $1M without adjusting the curve (always be careful what you wish for when you want the winners to win more). While 360 players at the bottom get paid more, players between 55th and 1,882 make less. That said, it’s not the only way to slice the pie. Only a couple of more poker weeks left in 2015! Action’s winding down for the holidays most everywhere (with a few exceptions) but the PNW Poker Calendar is here to help you make your plans for the upcoming year. Now, I know that Talking Stick, outside of Phoenix, isn’t everyone’s cup of tea, but coming up at the end of January, they have a three-day series of mid-level buy-in events ($200, $300, and $300) as part of their 2016 Staycation Weekend Poker Tournament. The tournaments run January 29-31, they only have a combined expected prize pool of about $130K, but if you play all three, you get two nights free lodging at the resort. The tournaments start at 11:15am, but there are still some early flights available; I saw round-trip prices for an 8:40am arrival in Phoenix—including a rental car—for $260, which is less than the price of the rooms. The prize pools and the deal may not make it enough to make it +EV from a financial perspective, but if we’ve had 20″ of rain in Portland by the end of December and traffic’s at a standstill because of all of the slides and sinkholes, maybe a golf trip to Arizona at the end of January might be just your kind of thing. Staycation deals go on sale this Saturday. Call 480-850-7734 for details. Thursday night at 8pm at Encore Club is a $1K Ladies Freeroll. $40 to re-buy, $20 to add-on at the first break. Next Saturday (the day after Christmas, aka the first day of Kwanzaa, or Boxing Day to those of you from more recent remnants of the British Empire) is a $35K guarantee ($200 buy-in and re-entry, $80 add-on). Saturday at 2pm, at The Game, is another of their $10K guaranteed to first place events (The Big Shot). $100 buy-in and re-entry, with a $100 add-on. 80 players max. Final Table‘s new 9pm $10 buy-in All-In-Or-Fold tournament started up Monday. Today will be a double guarantee ($2K, $20 buy-in/re-buy/add-on) at 11am and a triple guarantee ($4.5K, $40 buy-in/re-entry, $20 add-on) at 7pm. At 7:15pm tonight, Portland Players Club runs a $1K guarantee Big O tournament, with $20 buy-in and live re-buys, and a $30 add-on. Friday at the same time is double the guarantee, with a $40 buy-in/re-buy and $30 add-on. Saturday is a 12:15pm NLHE Freeroll, with $10 live re-buys and a $20 add-on. The only tournament series running in the Western States that I’m aware of is the WPT Five Diamond World Poker Classic at Bellagio; Steve Chanthabouasy was playing Day 2 of the Main Event as I was compiling this info yesterday (and as I was still writing, I read his post about losing a race to Brian Rast). There are still a couple of side events if you are in or can get to Vegas over the weekend. Tomorrow is a $5.2K entry tournament at 2pm. Saturday at 2pm is a $1,090 Turbo tournament. And, of course, there’s Friday’s $100K entry High Roller at 1pm. If you can brave the Siskiyous, The Ashland Social Club (in Ashland, natch) has its Holiday Poker Tournament Saturday at noon. $150 buy-in, $10 dealer appreciation, and it comes with prizes and bounties for knocking out staff members. Seating is limited, call 541-944-6490 for info. Aria has a $25K entry High Roller Sunday at 2pm. The Venetian New Year’s Extravaganza starts up on Christmas Day and runs through January 10. It features two $150K guarantee events, along with a $100K event. The Venetian has posted the schedule for the first of next year’s Deepstack Extravaganzas, as well. It begins at the end of January. Last week, I totally spaced out including the interview with Justin “Red” Phillips about winning the “TV Poker Hand” poll at Poker Update last month. With this one hand, a relative unknown was pushed to the forefront of the poker scene – Justin Phillips. And it was such a memorable hand that it emerged victorious among 31 other competitors in PokerUpdate.com Most Memorable Televised Poker Hand bracket. Mutant Poker readers pushed the hand to the top in the semi-final and final stages of the competition, and I was happy to help Jeremy Harkin put Justin in touch with Poker Update. Catch the publicity wave! Just heard my shoutout on @thinkingpoker pod 150. Too bad our WRGPT table already broke. Hope to see ya again! Also congrats on the big win! Local shoutout to @pdxheater on Andrew Brokos’s Thinking Poker podcast a couple weeks ago, as Brokos mentions he was at the same table of the World Rec.Gambling Poker Tournament, the long-running (25 years) play-by-email poker tournament. The podcast episode also has an interview with Brad WIllis, the head of blogging for PokerStars, and the author of Bust, an excellent series of articles about the effects of a police raid on an underground poker house in North Carolina. Last week’s Deal was the Deepstacks Poker Tour event in Calgary at Grey Eagle Casino & Resort. That’s about $154K in US dollars. It’s just about time to tick over another year here at Mutant Poker Central. My first post was on December 11, 2010, Five years ago come Friday. It wasn’t much, I was just getting things set up, and didn’t really start posting in earnest until January of 2011, Mucho water under the bridge since then, though I still haven’t made it to Prague for the December EPT. Maybe next year. The Poker Mutant celebrated his birthday this past weekend by cashing three straight online tournaments—including taking second place in a 143-player NLHE 6-Max—and by putting in a new tagline at the top of the page, a quote from November Niner Neil Blumenfield’s interview on the 2+2 Pokercast. If you get a wad of cash in your Christmas stocking, you can plan on a trip down to Sin City for two concurrent series running between Christmas and New Year’s. The Venetian has its New Year’s Eve Extravaganza running between Christmas Day and January 10, with three major events ($100K-$150K guarantees). None of the 34 events have buy-ins greater than $400, there are two each day (noon and 7pm), and there are 4pm satellites to the multi-day events. Planet Hollywood’s PHamous Poker Weekend just runs the 26th to the 30th of December, with a $565 buy-in $200K guarantee tournament anchoring the series. It also includes PLO and a Bounty PLO tournament. Portland Players Club has a new Bonus Guarantee schedule posted, with $500 Big O tournaments tonight and next Monday at 7:15pm, a $1K Big O at next Wednesday evening, and NLHE freerolls at 12:15pm Thursday through Saturday with $400, $500, and $1K guarantees, respectively. Late Addition: Saturday at 5pm is a $2K guarantee Big O game. $100 buy-in. At The Game this Saturday at 2pm, they’re having a Cash Game Tournament. The tournament ($30 buy-in/re-buy, $20 add-on plays down to the 10-handed final table. Everyone at the table gets a new stack of chips representing 10% of the prize money. The player with the shortest stack after each hand can elect to cash out for the value of their chips. To make the deal sweeter in this first run of the game, The Game is adding $1K to the prize pool. The WPT Five Diamond World Poker Classic at Bellagio runs through next week. The Venetian Winter Weekend Extravaganza starts today and runs through Tuesday. Making it into the top three percent of a tournament with more than 1,200 players takes a fair amount of good luck, as well as some skill. The stats for this run are pretty great, even though there were a couple of setbacks. I can look at this to console myself after making what may have been one of the worst a calls ever last night in the Final Table $20K, just a few spots from the money. UTG opens to 60 with J♦K♣ and UTG2 calls with 6♠7♠. I call, and SB comes along with A♦2♦. The flop is 8♣3♠5♥, I’m in the lead, but UTG bets his open-ended for 150. I call, SB calls, UTG drops out. 5♦ turn gets checked around, as does the 9♥ river, which makes UTG2’s straight. I’m such a wimp. I open to 120, getting calls from HJ (T♠Q♣) and SB (A♦A♠). I check the 3♠6♦[ td] flop, then fold after a bet from HJ and check-raise from the aces (which win the hand). I open to 120 and get called by HJ and D (K♠T♦ and K♦J♦, respectively). The flop is low and clubby: 3♣7♣2♣ and I get my c-bet of 200 through. UTG1 min-raises with Q♥A♥, I call, the flop is 7♦Q♦7♥ and I call a c-bet of 180. Probably a good thing the turn is 3♣, because a heart would have gotten me into lots of trouble. I check fold to a bet of 440. UTG limps with A♥8♥. UTG 1 is down to 690 and goes all-in with K♦Q♠. I call because I’m on the button, and UTG calls. The board gets checked to the river: K♥5♦3♠K♣7♥, the short stack triples up. UTG raises to 376 (yes, it’s one of those) with Q♠A♠. UTG1 has 9♣Q♣ and calls. CO calls with A♥J♣, and they let me see a cheap 4-way flop with crap when I’m relatively deep-stacked: 4♠4♥K♥. UTG bets 573 and I’m the only caller. A♣ on the turn and I bet 1K just to throw him off, which he calls. 9♥ on the river. I check it to see what he does. He just checks, and I’m finally up over starting stack. Action checks to me, I open to 450, and BB raises to 1,050 with K♥K♣. I fold. I open to 600 and get called by CO and SB. We all check the J♣3♥A♦ flop, CO has A♠A♥. SB, with 6♠5♦ bets 1,200 with an open-ended straight draw on the 4♥ turn, I fold, CO calls his set and hits quads with the A♣ on the river. He check-raises a 2,200 bluff from SB, leaving him with half a starting stack. UTG2 min-raises with 4♣4♠, getting calls from me and BB with 9♠A♠. The flop is 5♠A♦6♦, gets checked around, and after a 6♥ on the turn, UTG2 bets 925. I fold, BB calls, and wins on the river 8♠ with the better two pair. I open for 900 and get a call from the button’s T♣T♦. The flop is 9♠4♦8♠ and he’s more cautious than me, because he folds to a bet of 1.5K. UTG1 raises to 700 with 9♠9♥, I call, and BB is in with Q♣J♦. The flop is checked, but after the 7♠ turn, BB goes all-in for 2.8K. UTG1 and I both fold. UTG min-raises with K♣J♦ and I call. BB is in with Q♥8♦. Both have me well-covered. I call a bet of 800 after the K♥K♦2♦2♠ turn, then another 1.6K on the deceptive A♣ river and lose to the full house, naturally. UTG1 raises to 950 with 7♣7♠, off a 7.5K stack. There are big stacks at 19K, 26K, and 40K; everyone else is below the 10K starting stack, and I’m second-shortest. D calls with A♥9♣; he has the 26K stack. I shove my remaining 6K. UTG1 calls (?) leaving just 1.5K back, then D raises to 11.4K and he has to go all-in to call. The board runs out dangerously but ends up okay for me: 8♥8♦8♥4♠2♣. UTG1 gets a side-pot of 3K. We”re seven-handed at the table and I call a min-raise from UTG1 (T♦J♦). D calls after me with 6♦9♦. The flop is T♠4♥8♠, UTG1 shoves for 17K and takes the pot. UTG limps with J♥A♠, CO raises to 1.5K with T♦K♦, I call, and UTG shoves for 13K to win the pot. I open to 1.5K and BB comes along with T♠Q♠. He folds when I c-bet 3♠9♣3♥ for 2K. I open to 1.5K a second hand in a row, D 3-bets to 3.9K with a slightly larger stack, I 4-bet to 8K, and he calls. The flop is 6♠3♠6♦, I shove my remaining 9.1K and he calls with slim odds. The turn and river are 9♦9♠ and I double. On a bit of a roll, something you need to make it deep. There are eight players seated. Two of us are in the mid-30K range, the other big stack is in BB on this hand. UTG and UTG1 have 20K and 6K. HJ has only 4K, and CO is down to his last blind-and-a-half after doubling me up. On the button is a stack of 9K, and SB has 17K. So there’s some variety, and it’s nice to be on the top of the heap for a bit. UTG min-raises this hand with A♠9♥. I call and we’re HU. We both check down to the river: 3♠6♣T♥2♦7♠ and my kicker clinches it. Three in a row. I call a raise to 1.8K from UTG with 6♠6♣, hit top pair against a set on a 4♣9♦6♦ flop, don’t bet it, and thank my lucky stars afterward that I didn’t have an ace when I fold to a bet on the A♣ turn. I’m a genius. Action folds to me, I raise, BB folds his J♦5♠. BB is all-in for his last 377. UTG2 raises with 9♠J♣. I’m the only caller. I fold to a bet after the 4♦T♣4♠ flop, the turn and river are K♥A♠, BB has 6♣Q♠, nobody has a pair, BB ends up with 1.9K. I open to 1.8K and win. I open another hand, D calls with J♦T♣ and hits bottom pair with J♠2♦A♥. I c-bet 2K and he calls. We check through to the river (7♠9♦) and he takes the hand. UTG goes to 2.4K with 9♦9♣. I make kind of a loose call, and whiff the flop of 6♣K♥3♠. The Q♥ on the turn is tantalizing: I check-call 2.9K, but lose when the river is Q♦ and we both check. UTG1 opens A♦Q♣ to 1.6K, HJ has K♣T♦ and calls, and I’m in, in the worst shape of the three hands by far. Fortunately, after a bet from HJ of 2,450 on the 2♠6♥[9k] flop, I fold, as does UTG1. Aggression wins the day. BB calls my raise of 2.4K with A♣5♣, calls the c-bet of 3K on a T♣J♠K♦ flop, then check-folds to a bet of 6K when I hit the straight on the turn with 9♥. A pivotal hand. HJ raises to 2K with 4♠8♠. CO calls with T♥Q♠, I call, and BB is in with 6♦3♦. The 5♦J♦4♣ flop gives a little bit to almost everyone: I have the best flush draw, HJ has bottom pair, and BB has the open-ended straight (and thinks he has the flush, most likely). It checks to HJ, who bets 4.4K. I call, along with BB. 8♦ on the flop makes my flush, gives HJ two pair, and makes an inferior flush for BB, who’s drawing dead at this point. I check, BB goes all-in for 11K, HJ calls with less than 6K behind, and I shove. HJ folds. The river is a J♣ and I pick up a sizable pot that more than doubles me up. I open to 3K and SB calls with 8♦K♠. BB is all-in for 65. The flop is 9♣7♦6♣, SB goes all-in for 16.2K with his open-ended straight draw and I fold. BB has 2♥Q♣, a K♥ hits on the river, and SB wins the pot. The A♥ turn would have given me the pot. I raise to 4.8K and everyone folds. I open another hand and everyone folds. I have the best hand, but in an 9-way all-in, I’m actually a few points behind J♠6♠. The power of suited. The two player to my right (in the blinds in this hand) both have me covered by 30-50K. The two players on my left are below me, but have enough to cripple my stack. Three seats to my left is another stack that covers me, but by less than the blinds. There are a couple of <20BB stacks, and on the button is another potentially-crippling stack. UTG1 now covers me and raises to 5,555 with 5♦5♠, natch. I’m the only caller. Flop is 5♣6♥4♦, I check-fold to a bet of 8,888. I open to 7.5K and win the pot. On the button to my left is a stack 10K smaller than me (17BB). The blinds both have me covered by at least 8BB. UTG is a short stack with just 5BB, UTG1 has about the same as the button, and the table leader is in UTG2 with almost 60BB. Another short stack in UTG3 (8BB) and HJ has me covered with 36BB. Action folds to UTG3, who shoves A♦7♦. I re-shove and the blinds fold. The board runs out Q♠[hs]J♦A♣8♥ and I win the pot. UTG ships 5♥K♥ with just under 2.5BB and it folds to me. I call with a hand I would have played anyway and lose on the K♦8♦Q♣3♣5♦ board. Hopefully, the diamonds will do me better than the hearts in hand 140. I raise to 12K and everyone folds. Not a pair among them. SB has 64BB and leads the table. BB has 8K. UTG is sitting with almost 50BB, UTG1 has 22BB, HJ has 28BB, and UTG3 and CO both just have me covered with 18BB. One of those spots you’re hoping nobody with a big stack decides to blast off with an ace before it gets to you. The second chip leader folds 3♦7♠. UTG1 makes a bit more than a min-raise to 9K with Q♣K♥. three covering stacks ahead of me fold J♣7♦, 3♣8♥, and 4♥4♣. I have 15BB, there’s 4.5BB in the pot and a minimum 3-bet leaves me with less then 10BB, so I shove. The big stack has 3♦7♠, the short stack makes a tight fold of A♣J♥, and the original raiser lets it go. This has to be some kind of personal record. If you’re keeping track, this is the third time I’ve had queens in less than 35 hands. It’s the fifth time in the tournament so far. As I’ve said before, the distribution of starting hands only equalizes in the long run. I’m sure I’ll pay for this later. The short stack is UTG, and he shoves 6BB with A♣J♠. Big stacks in UTG1 and UTG2 fold. UTG3 has J♦Q♥ and folds with several covering stacks behind. There goes one of my queens. HJ ships a stack slightly smaller than mine with T♠T♦. CO folds my other queen with K♠Q♦, he’s got 25BB. D has 12BB and folds 6♦3♠. BB is the table chip leader, with a stack four times my size, but I can’t really worry about that with the queens. I shove, and he calls with 2♣2♠. The board is 5♦3♦7♣9♥4♦, and I win a massive pot. Bizarrely enough, preflop odds with the dead cards taken into consideration had me more or less even with the other three players. If the queens aren’t dead, then my equity preflop is 78%. Seven-handed after I eliminated two players (we’re now in the money) with the queens. I’m suddenly the table chip leader, by 6BB. One of the bigger stacks, with 35BB, limps in UTG with 7♠7♥. It folds to the shortest stack, in the CO, who shoves 12BB with 4♦A♦. SB folds. I rip my jacks in for 48BB and UTG calls off. The runout is 8♣T♠9♦A♠5♠. The short stack finds his ace and triples, but I take a substantial side pot that still gives me more chips. Action folds to SB, he min-raises with K♣A♥ and I 3-bet to 50K. He 4-bets for a total of 142K, I call, and get very lucky with a straight on the 9♠J♠6♣T♠7♠ board. No spade! Life is ugly and he goes out 93rd. My turn to be on the wrong side of queens. I open to 21K, it folds to BB who goes all-in for just under 200K. I call, he has Q♣Q♦ and I ship almost half my stack to him. Just arrogance. UTG min-raises with A♠7♠, HJ has just 30K and shoves holding T♣K♣. UTG has more than I do; I shove from BB, thenUTG folds. It looks good at first, but the run-out is 5♣J♠9♦Q♦8♥ and he pulls off a straight. UTG2, one of the two stacks under 100K goes all-in with 9♥9♠. Intermediate positions fold to me and I shove, with two bigger stacks behind. The biggest stack —UTG3 with 5x the shover’s chips—folded A♥T♥. The blinds fold, the board is 6♠T♠3♣K♠7♦ and I knock out a player in 75th. The Portland Nuts. How can I lose? I open to 30K and everyone folds. They know. Open to 30K. Folds all around. Sort of a dangerous spot to get this, early in the pecking order, I’m not about to slow-play it at 30BB. Fortunately, UTG goes all-in for about 100K, so there’s some profit to be made if the aces hold up. I shove over the top, everyone folds, he has 8♥8♣, the board is 6♣9♥K♣K♦J♥ and he’s out in 59th. I call a min-raise from D, hit top pair on the 6♣2♣9♠ flop, check-call 24K on the turn when K♦ hits, and we both check the K♥ river. He whiffed with J♠Q♣. D has the most chips at the table with 736K, but I’m in a tight race for 2nd place v BB. Action folds to me and I open to 32K. BB calls the min-raise, maybe because nearly every other raise I’ve made has been 3x or all-in. The flop is 9♥9♦9♠. I c-bet 35K, which he calls. 6♠ turn. I check-fold to an all-in, he has K♠J♣ and has me dominated. I open to 45K and win. I open 60K and UTG1 raises to 138K. Everyone else folds and I call. He has K♥Q♥, hits top pair on the K♠6♦J♣ flop, and I check-fold to his delayed c-bet of 158K on the 4♠ turn. I’m all-in with tens and 8BB, SB has A♠Q♠ and has me covered by just over 1BB. I’m good to the river: J♣5♦2♣6♦A♥. Five hours and ten minutes. 251 hands. 36th of 1,219 entries. +309% ROI. VPIP: 19.5% (49/251). Won 35.5% of hands played that did not go to showdown (11/31). 36.7% of hands played went to showdown (18/49). Won chips in 66.7% of hands that went to showdown (12/18). I’ve never really been a fan of turbo tournaments in general, but I have to say that doing a hand history of a super turbo has its advantages. I got into this game after busting just short of the money in one of my more regular options. It was already well under way by the time I got in; I started off with just over 12BB. I started off UTG. I’m planning to move all-in here anyway. HJ limps in with 8♦T♦ from a stack of 5K, I shove, D has just a few more chips than me and shoves 7♦7♠, then HJ calls. Two of the tens have been folded, the board runs out K♥2♦8♥Q♥Q♣ and I triple up. Nine hands and three levels later, I’m on another table in seat 4. We’re missing a couple players at the table. One player has just 4BB, most of the rest of the table is around my size, but everyone else has me covered. I shove and take the blinds. I shove and the short stack in the BB calls for just over 2BB with 5♠J♠. Two aces and a jack on the flop, another jack on the river and my full house is the better of the two. UTG raises to 3K with A♥J♥ and I call, the flop is K♥T♥2♣ and a 4♣ on the turn. I fold to a 4K bet with no pair and just the gutshot Broadway for a chop. Yeah, that’s right, UTG with half a big blind. The middle of a super turbo is not the time or place to go card dead. The previous round, if I’d opened UTG with 8♦6♥, I would have turned a straight against a pair of kings in the BB, but it would have required me to go all-in preflop, which doesn’t seem likely. Another hand, 9♠4♣ would have made trip fours on the river. But I shoved my tiny stack here, hoping to get enough to make it through the blinds. UTG1 called the big blind with Q♥8♥, BB had 6♣Q♦. The flop, of course, brought one of the queens, but I binked an ace on the river. UTG calls with 21K behind and T♠J♦. We’re just on the bubble, and I fold to a min-bet on the 7♣K♠T♥ flop. Back down to the sub-BB range. It’s a decent hand, but not even the best ace. UTG has T♣A♥ and calls, I’m all-in, SB limps with 4♣7♣, and BB raises to 30K with J♣A♣, covering both of the other players. The board is A♦9♦2♠Q♦Q♣, the jack kicker gives BB the pot, and I’m out at the bottom end of the cash. Forty minutes. 44 hands. 14th place of 85 entries. +64% ROI. What else can I possibly say about this? And—according to a tip—Davis Aalvik, the fourth-place finisher in the $1.5M guarantee WSOP Circuit event at Planet Hollywood, hails from the Portland area and still has family here. He took home more than $119K. 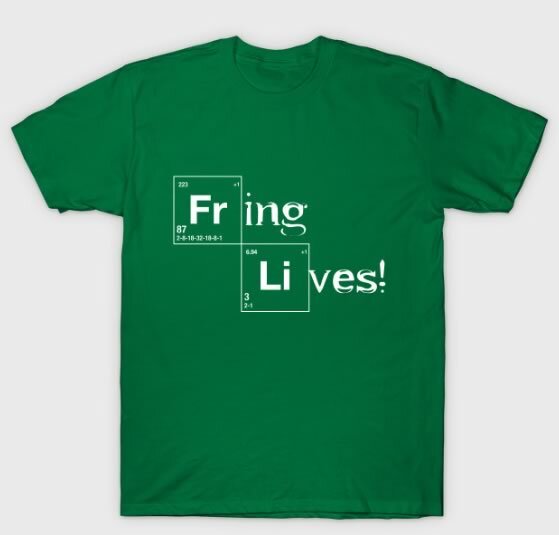 It’s a little late for this one, but I didn’t see it until after last week’s post. The Deepstacks Poker Tour, which ran a few events at Chinook Winds, is still operating at a number of larger venues in both the US and Canada (and one in Malta last year). The Calgary event started last week, but the Main Event is this weekend. The deal is a Main Event package that includes the entry fee and five nights at the series venue, the Grey Eagle Resort and Casino in southwest Calgary. “Calgary?” you say. Isn’t that a long ways off? No. It’s actually closer to Portland than Las Vegas. A direct flight from PDX to YYC is 95 minutes. Specifics: The package is for December 3-8, so if you’ve had a nice win the past month or so and didn’t blow it all on paying your property taxes (see: How to Separate Your Poker Bankroll from Your Liferoll) then you might want to pony up the C$3,094 for the package. That’s about US$2,315 at Tuesday’s exchange rate, just under 4:3. Buy-in for the event is C$2,500 (US$1,870). So you’re getting five nights at the casino for about US$90/night. The cheap flights are gone, but you can get an Air Canada Express direct flight to Calgary on Thursday evening for just over US$600. Flights coming back take a little longer, as they don’t go direct. The event guarantee is C$500K (US$373.9K), so for about $3K you get entry into a big event, five nights lodging, and a round-trip flight. Everyone I’ve talked to about Calgary poker says the tournament and cash games have lots of Alberta oil workers and businessmen. The first event of the series, a C$550 entry tournament with a guarantee of C$100K pulled in 529 entries. Saturday at noon is a $5K guarantee at Aces Full. $50 buy-in, with two live rebuys and a $20 add-on. They’re still offering a $10 food voucher for playing in their daily shootouts, beginning at 3pm. Friday night at 7pm is the First Friday $20K at Final Table. $100 buy-in, one re-entry, and a $50 add-on. Bring your Christmas shopping money! An email on Tuesday announced changes to their schedule, with a 9pm $10 buy-in All-In-Or-Fold tournament Monday-Thursday at 9pm (starting next Monday) that has $100 added to the prize pool. Next Wednesday (12/9) will be a double guarantee ($2K) at 11am and a triple guarantee ($4.5K) at 7pm. Thursday night is a $9K guarantee at Encore Club, $60 entry, no re-buy, $30 add-on. They’ve posted notices for a $1K Ladies Freeroll on the 17th, and another $35K guarantee event on the 26th. As usual, there’s a $13K on Friday night at 8pm ($60 buy-in, one live re-buy, and a $40 add-on). The Game has announced another $10K guaranteed-for-first event for the 19th. And today is Player Day, with no door fee if you get there between 11am and noon. Plus you get a free buffet lunch! Deepstacks Poker Tour finishes up its Championship series for its 2015 season in Calgary at Grey Eagle Resort (see the Deal). The Bicycle Casino WSOP Circuit stop, starts tomorrow with a $75K guarantee ring event ($365 buy-in), a $365 buy-in bounty ring event on Friday at noon, and at 5pm the $150 buy-in, $100K guarantee that was the Deal two weeks ago. The WPT at Bellagio starts the Five Diamond World Poker Classic tomorrow. Aria has two more High Roller events on Monday and Tuesday. If you have to ask how much the buy-in is, you can’t afford them; they’re so exclusive that they’re not on their Poker Room schedule. But they were a Deal back in August and a kid can dream, can’t they? Next Wednesday is the opening of the Venetian Winter Weekend Extravaganza. Eight events with buy-ins of $200 or less, with anywhere from $4.5K to $100K guarantees. Noon and 7pm events, with satellites to the $100K running at 4pm the first three days.